Star Wars has been a classic for decades, and with the release of new movies, a whole new generation is falling in love with the genre. As a result, plenty of children are asking for Star Wars themes in their rooms and plenty of adults want their very own Star Wars game room or Star Wars throne room for that matter. Here, you will find 45 unique ideas to incorporate the Star Wars theme in almost any room of the house. They can provide starting points and you could personalize them for your own space too. 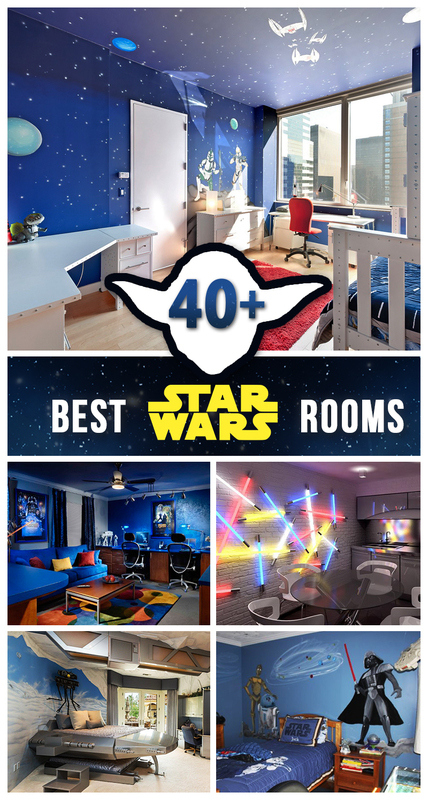 Check Out 45 Ways of Bringing Star Wars to Your Room! Do you wonder what it would be like to walk the halls of the death star? (Before Luke destroyed it of course) This living room idea uses various shades of gray and silver layered throughout the space to give it the feel of the ultimate weapon of the dark side. Embossed vinyl on the walls and even ceiling creates a sleek, mechanical look. Minimal Star Wars room decor keeps with the theme without going overboard. Ultra modern furniture completes the look for a sleek, and slightly dark, style to the room. And, a death star pendant light brings the whole room together. This room doesn’t go overboard with the Star Wars decor, but it still brings the force to a living room. 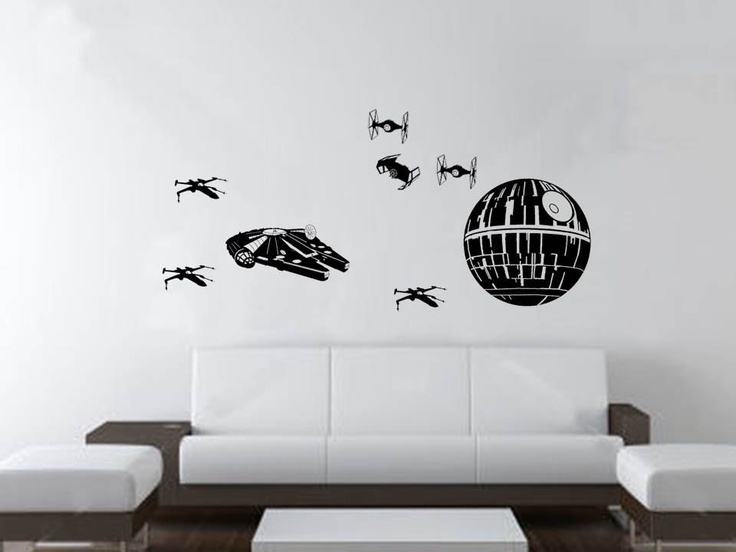 The vinyl Star Wars room decals depict an epic space battle scene complete with x-wing fighters, tie fighters, the Millennium Falcon, and the death star. 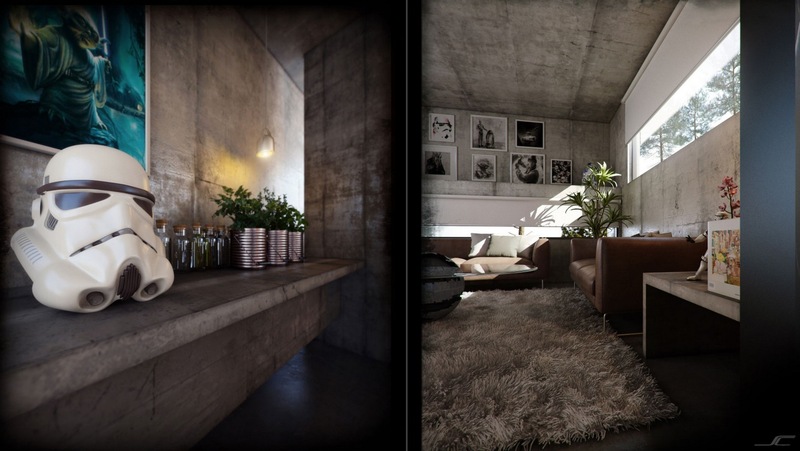 The use of a stark black and white color palette ensures the theme itself remains the focal point of the space. Modern and minimalist furniture serves its purpose while keeping a futuristic feel too. This room proves a Star Wars theme can be attractive without saturating the whole space with images and decor reminiscent of the movie. Tasteful home decor and the Star Wars them come together in this design for a unique, artistic feel. The walls have an industrial stone look, offering the perfect palette for the Star Wars room design. A steel gray shag rug adds just enough warmth to the room to keep it from being too stark. The mix of browns, tans, and grays in the furniture are reminiscent of the Mos Eisley Cantina, where we all know Han shot first. A selection of unique Star Wars artwork and a storm trooper helmet bring the science fiction theme to life throughout the room. 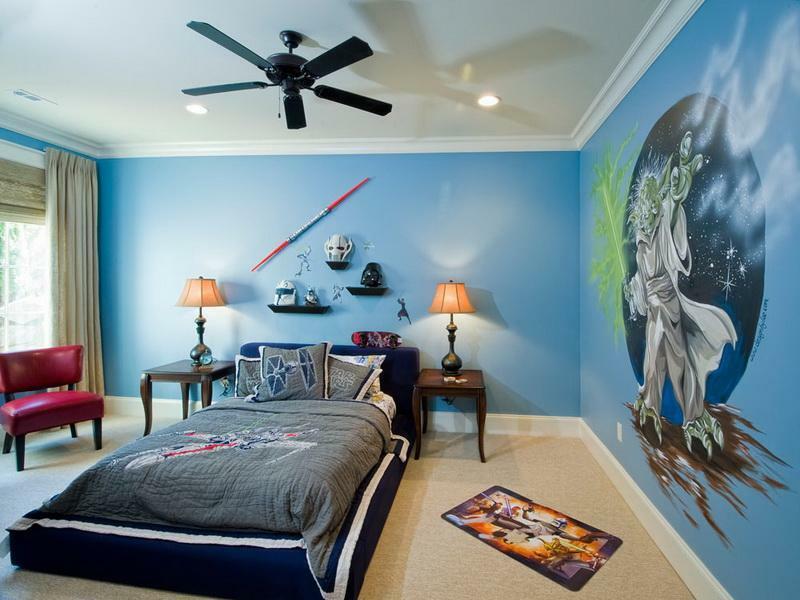 The use of Star Wars theme wallpaper will saturate a child’s room in the epic story. Kids will love feeling like they really are in space with every surface but the floor featuring stars, tie fighters, and alien planets. A fun and ever so slightly industrial style child’s bed with Star Wars bedding and complementary bedroom furniture will help a kid feel like they really are a space ship. The pops of red found in a soft throw rug and desk chair break up the space just enough to keep it from becoming monochromatic. Finishing with a hardwood floor keeps the space grounded without going overboard in the theme. Step into The Empire Strikes Back with these Star Wars room decorations designed to saturate the room in the movie. The whole theme of this room makes one feel that they are on the planet Hoth, where an epic battle took place. The bed is designed as a T-47 airspeeder, and it even includes a trundle underneath for extra sleeping space. Textured walls, sky blue paint, and fluffy bedding create the feel of snow throughout the room. The rest of the furniture is non-descript so that it doesn’t take attention away from the thematic bed. Finally, individual Star Wars specific elements personalize the room perfectly. 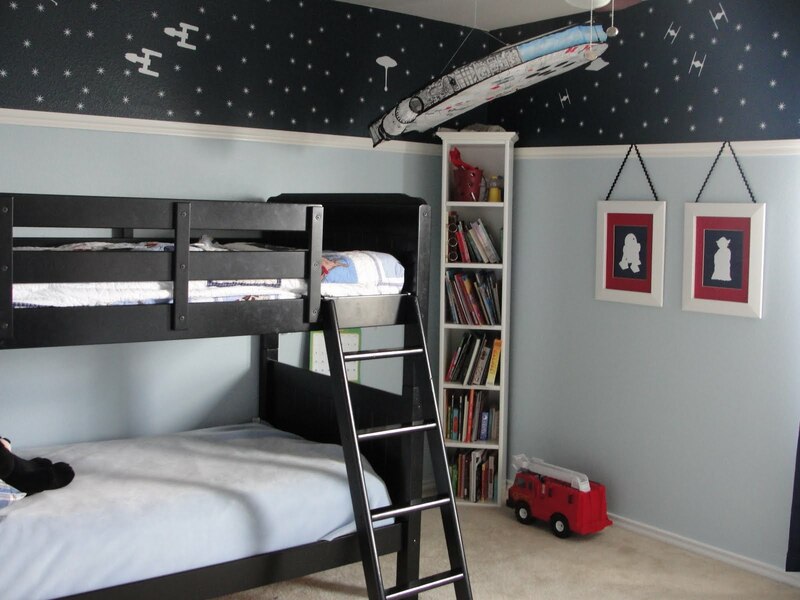 Colorful blue paint sets the stage for this Star Wars kids room. Wall decals depict important characters, like Yoda and Darth Maul for the perfect dash of excitement to the space. Bedding depicts various ships from the movies, including a tie and x-wing fighter. The furniture in this room is a bit more grown-up, making it the ideal transitional space for older children and pre-teens who may want something more mature. Floating shelves offer the perfect space for various Star Wars memorabilia too. Neutral window coverings and lighting ensures the space isn’t completely saturated with color and Star Wars details. What Star Wars baby room would be complete without a stuffed tauntaun rug on the floor? 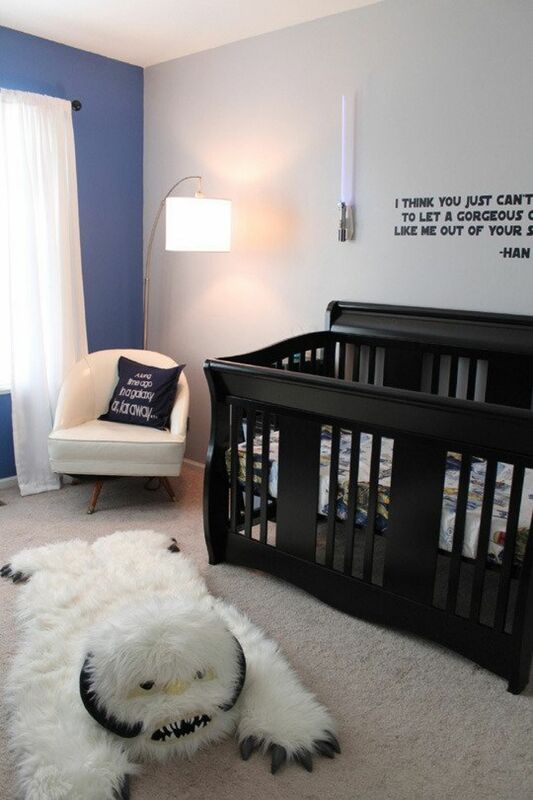 This nursery space is the right combination of Star Wars as well as soft colors and textures to make it perfect for a little one. Quotes from the movies appear as vinyl wall decals and as a fun throw pillow on a corner chair. 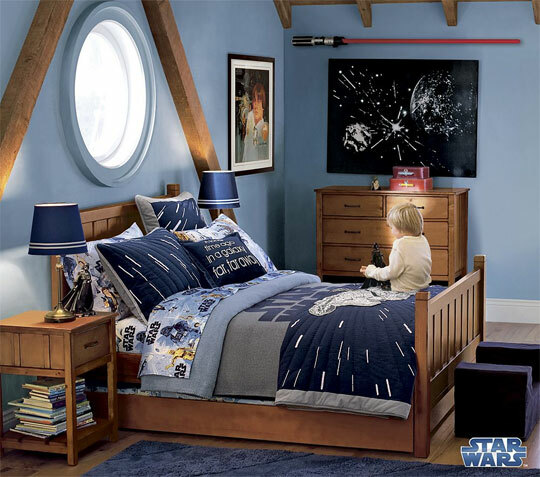 A toy Star Wars lightsaber is just enough decor in this soft room. Dark wood furnishings provide a nice contrast to bright white and blue walls. Soft, sheer curtains allow just enough light in for an airy, baby soft space. 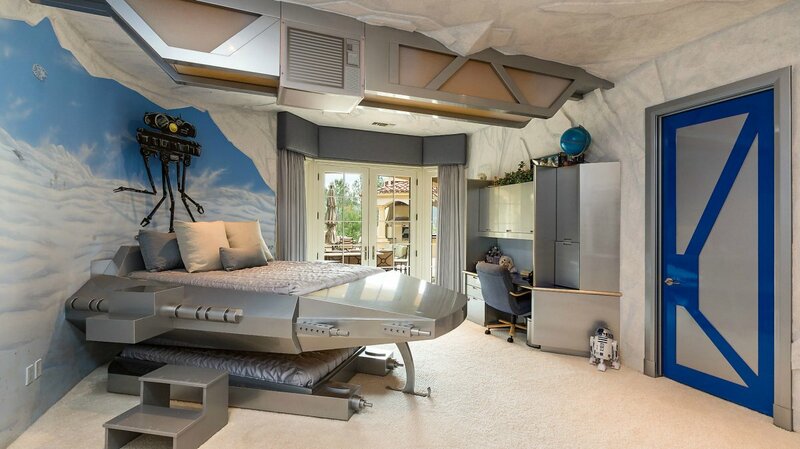 This intricately designed Star Wars bedroom has a more mature look and feel to it while remaining the ideal space for children. The top of the walls is painted with a deep, dark blue and enhanced with star and spaceship decals. The lower part of the walls features a soft blue-gray color reminiscent of mechanical spaceship parts. The two shades are set apart by bright white molding. Pops of red add depth to the design through framed artwork on the walls. A model Millennium Falcon hangs from the ceiling as if it is flying through space. A dark wood bunk bed keeps the room fun while offering contrast to the colors as well. This is a fun take on the Star Wars theme thanks to the Lego details reminiscent of the cute video game. Wall art from the Lego video games becomes the focal point of the room, set off by soft blue-gray walls. 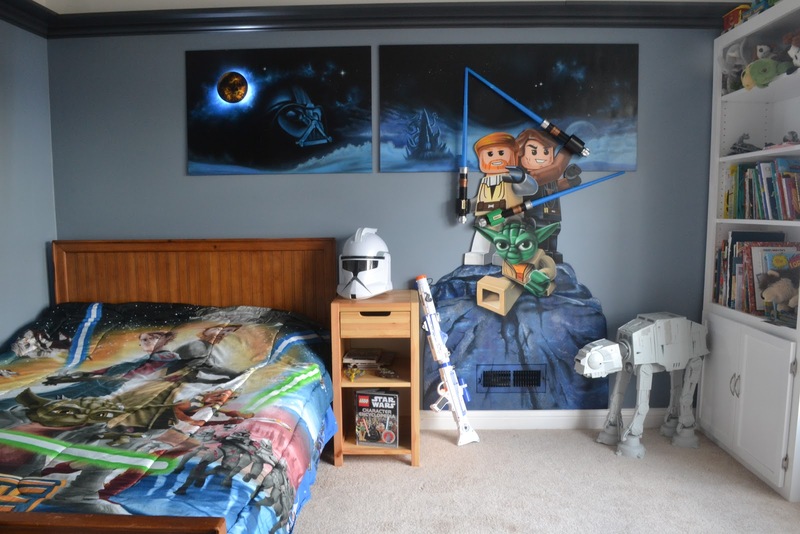 A Lego At-AT Walker takes up one corner and other small Star Wars decor completes a fun look for any boy’s room. Bedding from Attack of the Clones keeps the cute, childlike style without getting too serious. And, minimalist furniture doesn’t detract from all of the cute Star Wars details. Lighting is contributed to with LED light bars hidden behind the Star Wars wall mural. The color blue just seems to reflect Star Wars in every way, and this room definitely plays on that idea. Various shades of blue are used throughout this Star Wars kids room including paint on the walls, a soft rug, bedding, and lampshades. 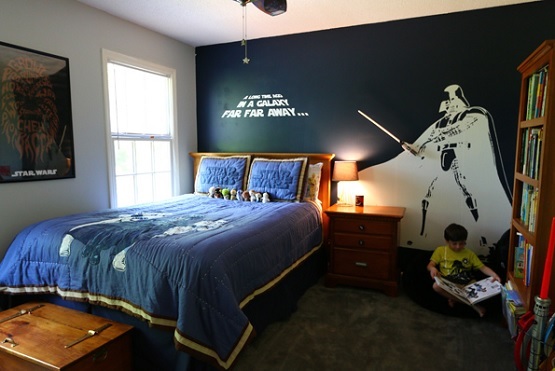 The movie itself shows through in wall art and Star Wars specific bedding. Natural wood in the furniture and exposed beams on the wall and ceiling provide just enough color contrast to keep the room from being too monochromatic. Finally, a toy lightsaber serves as extra wall decor to complete the theme without being too cutesy. When it comes to Star Wars room ideas, you could choose subtle or bold and bright. This room is the latter of these two options. Thanks to bright blue wall paint and matching bedding, this is definitely a bold room. 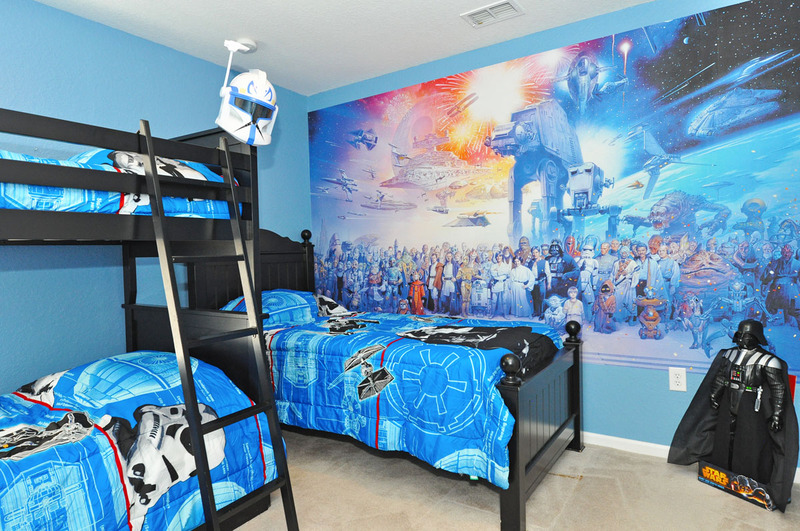 The bedding itself is in keeping with the Star Wars theme, and a brightly colored mural takes up one wall, adding layers to the shades of blue. Contrasting dark wood furniture adds depth to the space. A Star Wars helmet just adds a fun element to the decor in the space, which is otherwise sparsely decorated. This is the ideal room for multiple children, twins or even triplets. Who says Star Wars themes have to be kept only to bedrooms? This Star Wars room design shows that even the living room can be fun, exciting, and somewhat geeky. 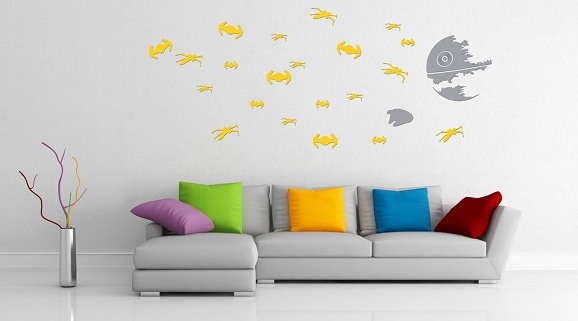 Color is the main element of this theme with bright yellow vinyl wall decals depicting an epic battle with Tie fighters, X-wing fighters and the death star being rebuilt. The colorful theme continues with bright green, yellow, blue, red and purple pillows tossed on the couch. Even stark tree branches get a colorful treatment. The rest of the room remains a neutral pale gray to ensure specific elements get all the attention. Many Star Wars room decorations focus on Luke Skywalker, Yoda and all the heroes. This room, though, takes a walk on the dark side. Starting with a deep blue accent wall, the Star Wars spirit begins through a life sized Darth Vader wall decal and the classic wording from the beginning of the movies in vinyl too. The brighter blue bedding features images of Darth Vader and his storm troopers too. Aside from the Chewbacca artwork, the rest of the room remains free of Star Wars elements so that the main ones get all the attention. Natural wood furnishings and dark carpet add depth to the space too. Not every Star Wars room decoration has to be bright and airy, especially if the space is for the true fan. 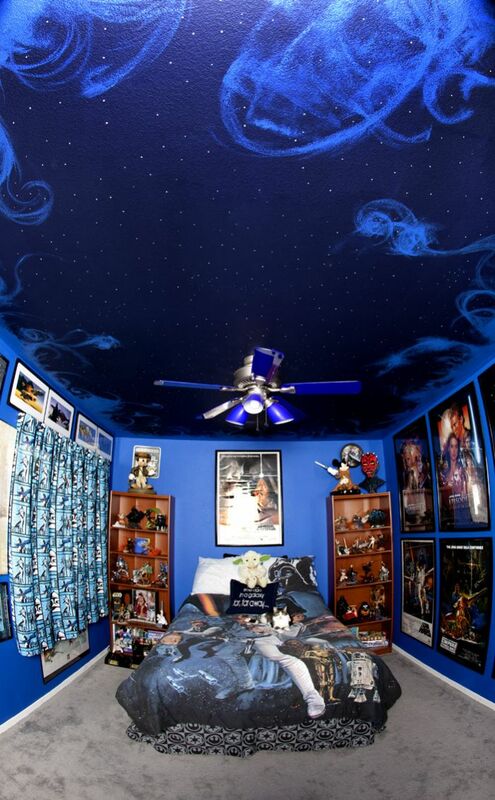 This is certainly the room for the ultimate Star Wars fan. The ceiling includes a dark blue sky with stars showing through as well as blue sun flairs around the edges, fading into the lighter blue walls. Gray flooring provides contrast for the room. All of the bedding is in keeping with the Star Wars theme and numerous posters and art pieces adorn the walls. Two book shelves provide plenty of space for Star Wars memorabilia and toys too.